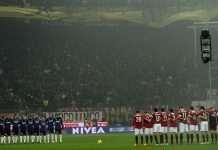 The Serie A, to an extent, still remains a place where experience is deemed of greater importance than youthful energy. 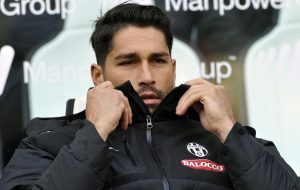 Like controversy, the fielding of veterans has come to be deeply ingrained in the league and despite Udinese’s Antonio Di Natale and Hellas Verona’s Luca Toni calling time on their careers last season, the stable is apparently in no short supply of the old warhorses. Below are some of the veterans who would be lighting up our screens this season. 86. 10 Naira equals to U.S. $1 when a 17-year-old Buffon made his first appearance as a professional for Parma against AC Milan on 19 November 1995. He was able to keep a clean sheet – the first of many. In 2001, Juventus signed Buffon from Parma for £38 million making him the most expensive goalkeeper in the history of the game. 15 years later and in an era of frenetic spending, he still holds the record. His trophy haul looks pretty impressive too – Seven Serie A titles, two Coppa Italia titles and five Super Coppa Italia titles since making his debut for the Old Lady in a 4-0 home win against Venezia in the 2001/02 season. A world cup winner for Italy, the only trophy which has so far eluded him remains the Champions League and in 2003, despite saving two penalties, he still ended up on the losing side. Like fine wine, Buffon gets better with age. In March 2016, he set a goalkeeping record for the longest run without conceding a Serie A goal when Juventus beat neighbours Torino 4-1. Buffon overtook Sebastiano Rossi’s record of 929 minutes for Milan, set in the 1993-94 season, in the fourth minute bringing his record to 974 minutes although he was finally beaten early in the second half courtesy of an Andrea Belotti penalty. Buffon also holds the record of the most consecutive clean sheets (ten) in the league in that same season. Buffon’s records speak volumes – in the past four seasons, he has made 112 league appearances for Juventus and has kept 58 clean sheets. When he hangs up his gloves, the world would surely miss a legend but meanwhile let’s enjoy his repertoire of skills (mind-boggling saves being at the very top), his wide grin and his raucous celebratory antics. Good thing is that he’s contracted to Juventus until 2018. We do not want to think about what will happen after that. Hardly can a paragraph be written about Roma without Totti appearing at least twice. It is no great riddle why this is so. Totti joined Roma in 1989, aged just 12, after a rapid progress through the junior ranks. He was handed his first-team debut as a 16-year-old in March 1993. He scored his first goal for the Giallorossi in September 1994 against Foggia and quickly established himself as a first-team regular, becoming the youngest club captain in the history of the league when he inherited the armband from the Brazilian defender Aldair in 1998. Here’s a marriage that has endured for 25 seasons in the midst of tempting offers from suitors abroad. A marriage built on unalloyed loyalty befitting of II Re Di Roma (The King of Rome). One cannot possibly go over his records without sounding like a dusty dog-eared history book because Totti is history himself. Totti is Roma’s top goal scorer and the most capped player in the club’s history. Totti continues to impress even at his age with a goal in his last game. No party without Totti, as usual. He is the top scorer among currently active players in Serie A and the second highest scorer of all-time in Italian League history with 249 goals from 602 matches. He is Derby della Capitale’s all-time top marksman. His trophy cabinet (1 Scudetto, 2 Coppa Italia titles and 2 Supercoppa Italia titles) might have been fairly modest, but he had a reputation that was huge. Totti, who turns 40 this month, made his 600th appearance in a 3-0 win against Chievo in May and finished the season strongly, notching 5 goals and 4 assists and playing an integral role in helping Roma to a third place finish. All good things come to an end, therefore, nine months from now, the living embodiment of all that is Roma will stride upon the turf for the last time. 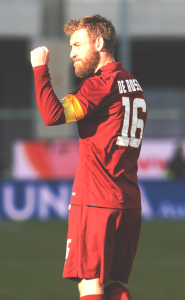 Though the 33-year-old doesn’t have quite the cult following Totti has in the Eternal City, De Rossi could rightly be considered as a Roma great. De Rossi made his professional debut under Fabio Capello during the 2001-2002 season and made his Serie A debut the following year. He has since remained in Roma and has won the Coppa Italia twice and the 2007 Supercoppa Italia. In 2006, he was named the league’s young footballer of the year and the Serie A Italian foorballer of the year in 2009. De Rossi continues to battle for AS Roma in midfield. A fantastic servant we’ve all come to love. While Totti might be nearing the end of a storied career, De Rossi relatively has a few years to spare and going by the past three seasons, he still has enough fuel in his engine. In the 2013-14 season, he made 32 league appearances for Roma, 26 in 2014-15 and 24 in 2015-16. Boriello, when he pulls the plug on his career would be most remembered for his nomadic tendencies than what he brought to the field of play. He has turned up for several Italian clubs including Milan, Sampdoria, Empoli, Juventus, Roma, Carpi, Atalanta. It does not however mean that he was lacking in talent. Marco rejected several offers to go abroad and chose to stay in the Serie A. As a matter of fact, in the 2007-08 season, Boriello finished third in the scorers’ chart behind Alessandro Del Piero and David Trezeguet after scoring 19 goals in 35 matches for newly promoted Genoa. In his second season at Milan, Boriello notched 14 league goals in 26 appearances. In 2010-11, he finished with 17 goals in all competitions for Roma, making him a second top scorer behind Totti. The 34-year-old has already started the season with aplomb for his new club Cagliari, scoring two times in two league games, one against his former employers, Roma. Boriello is apparently not the only player that was constantly beaten by the travel bug in the course of his career. In this regard, Fabio Quagliarella comes a close second. Quagliarella has laced his boots for eight different Italian clubs, winning three consecutive Scudetti during his stint at Juventus. In 2008-09, arguably the best period in his career, Quagliarella scored 21 goals in all competitions for Udinese including eight goals in the UEFA Cup , where Udinese reached the quarter-finals. Sharp shooter and one of the most feared strikers in the Serie A, Fabio continues to impress even his in twilight years. In 2009-10, he netted 11 times to help Napoli qualify for the Europa League. He has opened his account for Sampdoria this season.